"Super Science Girls! ", the latest book from Main Line author Ellen Langas, right, introduces girls to careers in science, technology, engineering and math (STEM). The book was released Thursday. A new book by a Philadelphia-area author to encourage girls to explore STEM careers was released Thursday in conjunction with Take Our Daughters and Sons to Work Day. 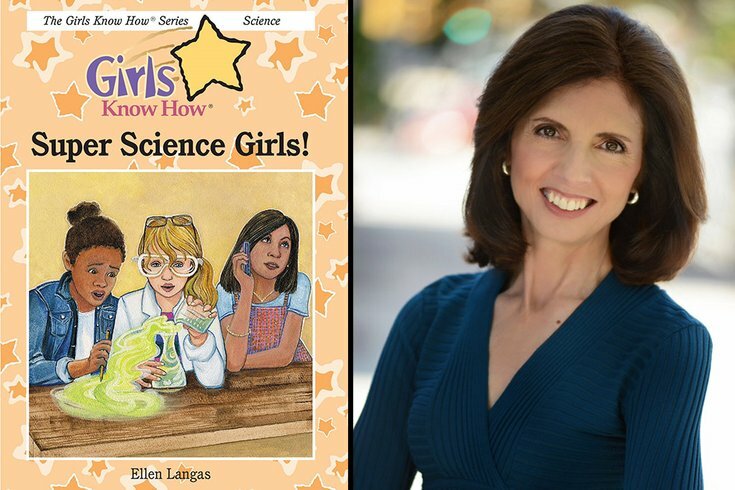 Written by Ellen Langas of Haverford, "Super Science Girls!" is the latest book in her Girls Know How series, which encourages girls to explore their dream careers. It introduces girls to careers in science, technology, engineering and math, or STEM, a field that continues to be underrepresented by women. "While planning a career is probably not on the radar in elementary school, it's the ideal time to lay the groundwork," Langas, a youth career education advocate and president of NouSoma Communications Inc., said in a statement announcing the latest book. "By the time girls reach middle school, research indicates that body consciousness and social acceptance can pull focus from academics, causing girls to shelve their dreams and ambitions. Part of the solution is to offer consistent, age-appropriate messages in an engaging way, including positive role models and stories that kids can identify with." The Girls Know How books use diverse characters – including some based on real-life female role models – to lend subtle exposure to careers. Sylvia Todd, who created the popular online "Sylvia's Super-Awesome Maker Show" at age 8, is the inspiration behind Sylvia's character in "Super Science Girls!" "Girls are as naturally inquisitive as boys, and if they are exposed to science at a young age, they are likely to embrace it," Pat Woody Reeves said in a statement. She is the former chief engineer of the U.S. Naval Surface Warfare Center, and her career served as the basis for one of the characters in the latest book. "Super Science Girls!" explores science through the eyes of Sylvia and her best friend Kristen, who dream of winning the middle school science fair competition together. Along the way, the book highlights experiments, the scientific method and women in science. "Helping girls discover the relevance of science, technology, engineering and math (STEM) in everyday life stimulates curiosity and problem-solving skills, and introduces a variety of career paths," added Langas, who has held positions with Corning Inc. and Westinghouse and was a corporate officer and popular program host at QVC Inc. In celebration of Take Our Daughters and Sons to Work Day, Girls Know How will donate one book to Girls Inc. of Greater Philadelphia & Southern New Jersey for every two sold through Sunday.